Even when consumers do their best to obtain services from providers in their health plan’s network, they may still face unexpected charges. 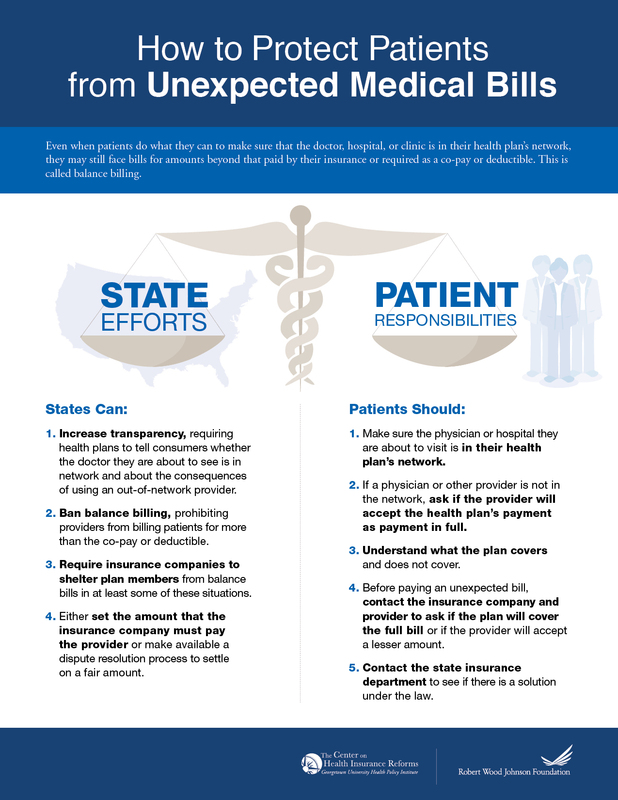 Unexpected bills may show up when a consumer goes to a network hospital for emergency care, but is treated by a physician or other health professional who is not in the health plan’s network. Surprise bills may also arrive when a consumer identifies a network hospital and a physician for a procedure such as a baby delivery or a knee replacement, but is also treated by an anesthesiologist, assistant surgeon, or other out-of-network provider. Even if the health plan pays its usual amount for the services, the provider may find the payment inadequate and send a bill for the balance (i.e., a balance bill). Large balance bills, a common source of medical debt, can be stressful for consumers. Federal law does not protect consumers from balance billing or surprise billing. About one-fourth of all states have policies to address at least some of the scenarios that typically result in unexpected charges. Our newly released report evaluates protections in California, Colorado, Florida, Maryland, New Mexico, New York, and Texas. It describes the ways these states have opted to protect consumers in some or all of these scenarios. For example, California prohibits physicians from balance billing in emergency scenarios, although this consumer protection does not apply to all plans. California is currently considering whether to extend this protection to surprise billing in non-emergency scenarios. By contrast, Colorado protects consumers by requiring that health plans hold their members harmless in both emergency and surprise billing situations. New York’s new law, perhaps the most comprehensive in protecting consumers, expands existing protections. The law, implemented this year, bans balance billing in emergency scenarios and to surprise billing as long as the consumer assigns the provider’s claim to the health plan (i.e., the consumer transfers the right to reimbursement to the provider). For disputes about the right amount of payment, New York also makes available an independent dispute resolution process for health plans and providers to determine a fair rate. The law also adds new disclosure requirements on both plans and providers to help consumers understand the consequences of going out of network. Other states have at most limited provisions in place to protect consumers from surprise bills. In some of these states, however, such as New Mexico, the marketplace environment has made balance billing an infrequent occurrence. But market conditions change. As more health plans implement narrow networks, increased opportunities for balance billing may arise. Pressures on states to protect consumers may grow. This year, Connecticut included new protections in legislation that is awaiting the governor’s signature. Similarly, New Jersey is considering new protections, although it has deferred action on its proposal until later in the year. States that consider legislative remedies, as well as most stakeholders, typically share the goal of ensuring that consumers are not liable for charges that are mostly out of their control. But as highlighted in our new report, state approaches vary. The most effective protections appear to share two common elements. First they do not require active intervention from consumers. Second, they include an acceptable means of determining the payment amount – which may include a formula for setting payment or a dispute resolution process. In addition, many states have expanded disclosure requirements to help consumers become more aware of situations that can generate surprise bills. But stakeholders differ on whether such requirements are adequate without other measures. State actions to protect consumers from unexpected balance bills can help to achieve that goal of the Affordable Care Act – to ensure that health costs do not threaten American’s financial security.